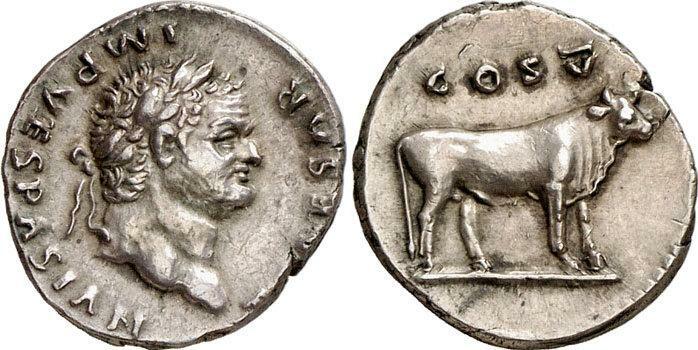 Denarius, struck 74 AD in Rome. Obv. 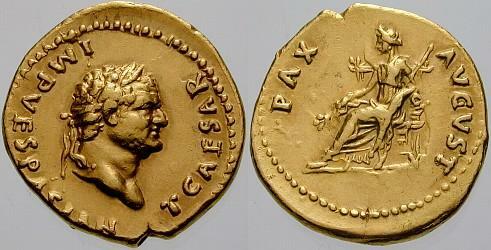 : T CAESAR IMP VESPASIAN, Titus head, laur., r. Rev. : PONTIF TR P COS III, Titus seated r., r. holding sceptre, l. branch. Rev. : PONTIF TR P COS III, winged caduceus. Rev. : PONTIF TR POT, Fortuna stg. l. on base, r. holding rudder, l. cornucopiae. Rev. : VESTA, round domed tetrastyle temple; within, Vesta stg. facing; flanked by statue to left and right of temple. 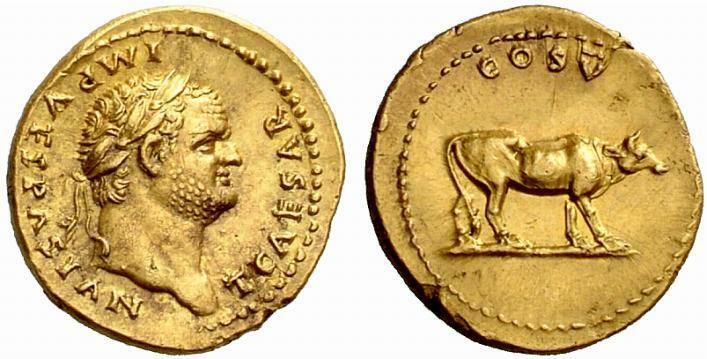 Aureus, struck 75 AD in Rome. Rev. : COS IIII (ex. ), bull butting r. Rev. : COS IIII (ex. ), capricorn r., holding globe attached to rudder; cornucopia above its back. Rev. : PAX AVGVST, Pax seated l., r. holding branch, l. sceptre. 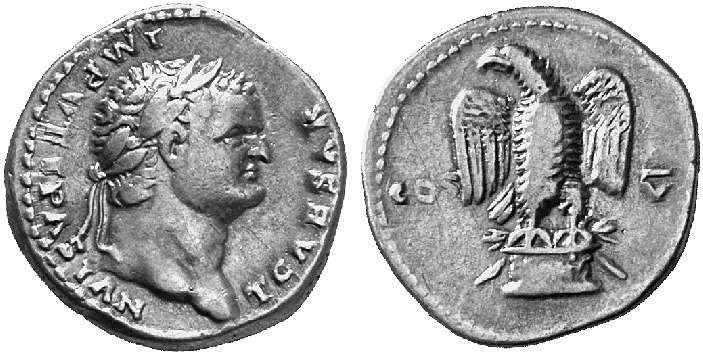 Denarius, struck 75 AD in Rome. Rev. : PONTIF TR P COS IIII, Pax seated l., r. holding branch. Rev. : PONTIF TR P COS IIII, Securitas seated l., head resting on raised arm. Rev. 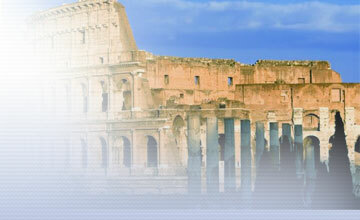 : PONTIF TR P COS IIII, Victory stg. l. on altar, flanked by snakes. Rev. : IMP III (ex. 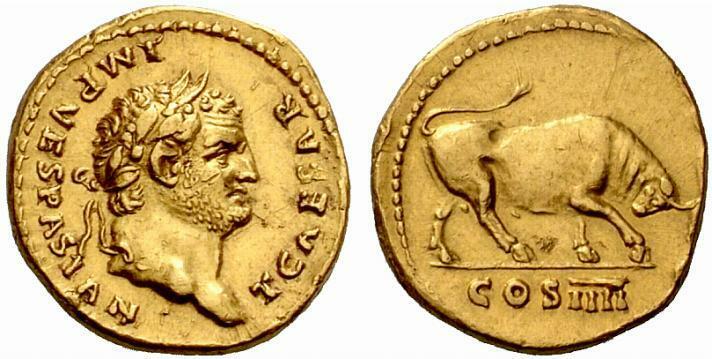 ), bull butting r.
AV Quinarius, struck 75 AD in Rome. Rev. : VICTORIA AVGVST, Victory adv. r., r. holding wreath, l. palm. AR Quinarius, struck 75 AD in Rome. Rev. : VICTORIA AVGVSTI, Victory adv. r., r. holding wreath, l. palm. Rev. : VICTORIA AVGVST, Victory seated l., holding wreath and palm. Rev. : VICTORIA AVGVSTI, Victory seated l., holding wreath and palm. 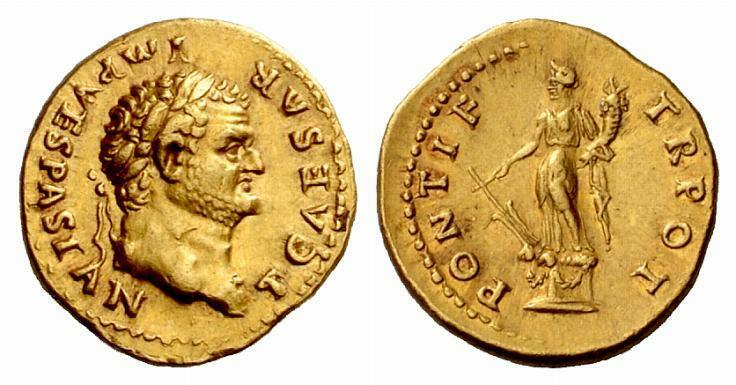 Aureus, struck 76 AD in Rome. Rev. : AETERNITAS, Aeternitas stg. l., r. holding head of sun, l. head of moon; to l., altar. Rev. : COS V, cow stg. r.
Denarius, struck 76 AD in Rome. Rev. : COS V, bull stg. r. Rev. : COS V, cow stg. l. Rev. : COS - V, eagle stg. facing on garlanded base, head r., wings open. Rev. : COS - V, eagle stg. facing on garlanded base, head l., wings open. Obv. 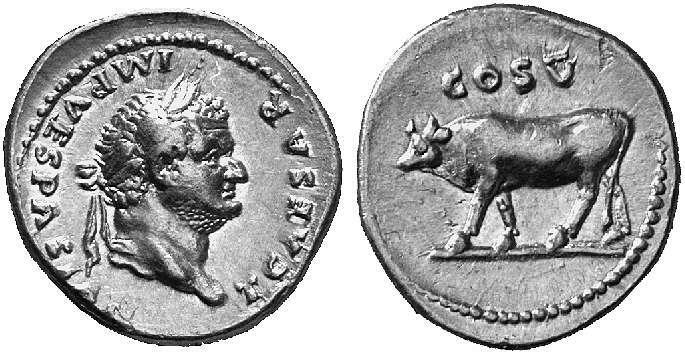 : T CAESAR IMP VESPASIAN, Titus head, laur., l. Rev. : IOVIS CVSTOS, Jupiter stg. facing, r. holding patera over altar, l. sceptre. Rev. : PONTIF TR P COS V, Pax seated l., r. holding branch. 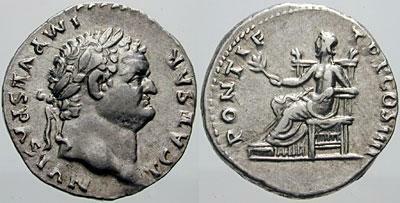 Denarius, struck 77-78 AD in Rome. Rev. : COS VI (ex. ), two oxen, yoked l.